T21-71 for $204. A 21” traditional style shade hand cut of solid brass, finished with an antique brass patina, perfect for a painting 32” to 42”. One of our many antique brass picture lights. 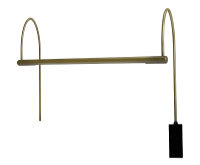 SL30-71, $316 for this 30” antique brass slimline picture light. The 30” slimline features six 15 watt bulbs for a total of 90 watts of warm incandescent illumination. Perfect for paintings from 38” to 48” wide or a little wider. AB7-71 Small Antique brass battery art light. This is the smallest size battery art light, at 7” the small #31 incandescent bulb reflects just enough light for a painting between 9” and 13” wide. BSLED14-71 Antique Brass LED Battery art light. Elegant and highly efficient, this battery light contains the batteries in a sleek back plate attached with 2 screws to the wall, just like your artwork. The LED array lasts for 30,000 hours, you’ll have to change batteries every 60 hours or so. Perfect to light artwork up to 28” wide with no outlets required! This category includes Antique Brass and Weathered Brass. Either style finish evokes a classic era, implying antiquity, conveying an aura of gentility, wealth and times gone by. Many colonial and traditional homes (as well as schools and museums) are graced with fixtures, furniture hinges, and objet d'art of antique or weathered brass. Certainly many framed paintings are cherished because of their connection to bygone eras of style and discernment. Illuminating such artwork with picture lights of antique or weathered patinas is almost the only way to go. A surprisingly economical yet beautiful choice is the A14-71, an Advent line lamp, the 14" Antique Brass Picture light. Similarly popular (among our top two best sellers) is the A7-71, also an Advent line lamp, the 7" Antique Brass Picture Light. The A14 would be perfect for a 28" image, the A7 would be for a 14" frame. Quite often people choose multiple lights of different sizes but stay within the same style line and of course the same finish. This allows for a consistent design throughout the room (or hall, or house) and lends an aura of sophistication and permanence to the art itself. The House of Troy company cuts their own shades (right in Vermont) using the highest quality solid brass. Once the shades are made several finishing processes are used to achieve a variety of hand rubbed patinas: Antique Brass is an oxidized finish, the brass is darkened, then partially rubbed away, leaving dark highlights throughout. Weathered Brass, is prepared by leaving slight surface variations on the brass, then lightly dipping in an acid oxide to create a natural, aged appearance. All of these fine oxidized finishes are protected with a finish coat of matte lacquer. Since these finishing processes are done in their Vermont factory, under the strict control of owners and long time workers, the consistency and qualityy of these finishes is guaranteed. Vermont craftsmen and women spend their working lives following the time-honored traditions of hand-crafting and attention to detail so rarely possible in these modern times. Of course another fashionable choice is to choose a sleek, timeless style such as the Slim-Line style, and by using a patina finish such as antique or weathered brass, match the light to the image. A fabulous example of this would be the SL30-71, or 30" Slim-Line in Antique Brass. 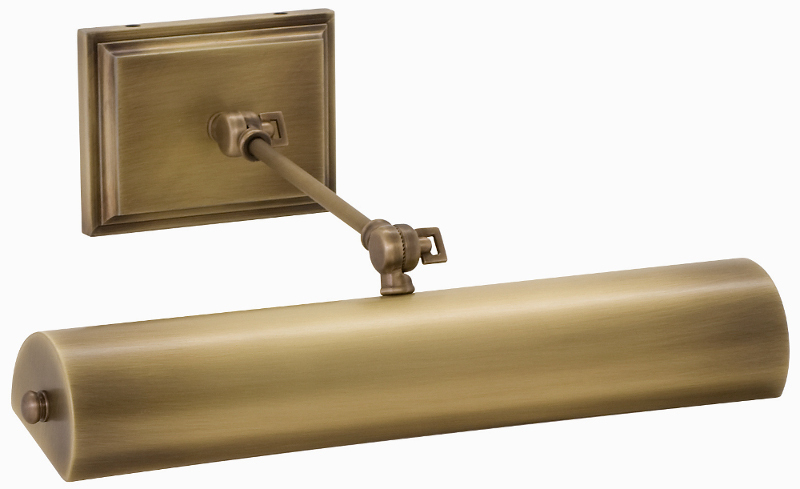 Antique Brass is a finish that is used across all product lines, from Direct-Wire (DCF24-71 Direct Wire Fluorescent 24" Antique Brass Picture Light) to the Hyde Park line (HP16-71 Hyde Park 16" Antique Brass Picture Light).